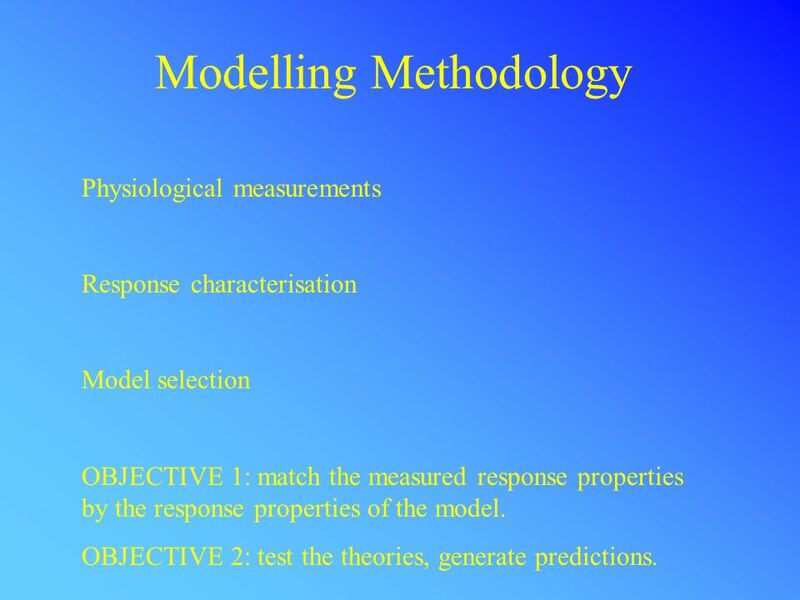 11 Modelling Methodology Physiological measurements Response characterisation Model selection OBJECTIVE 1: match the measured response properties by the response properties of the model. 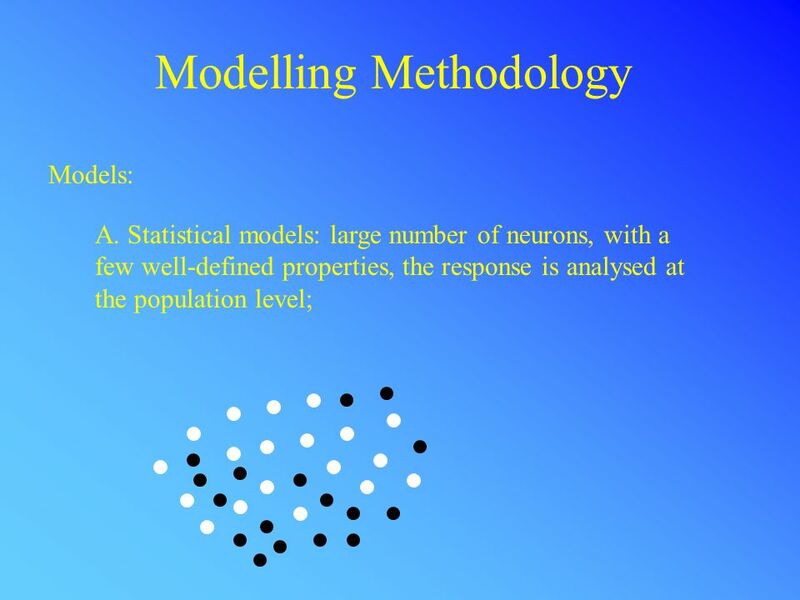 OBJECTIVE 2: test the theories, generate predictions. 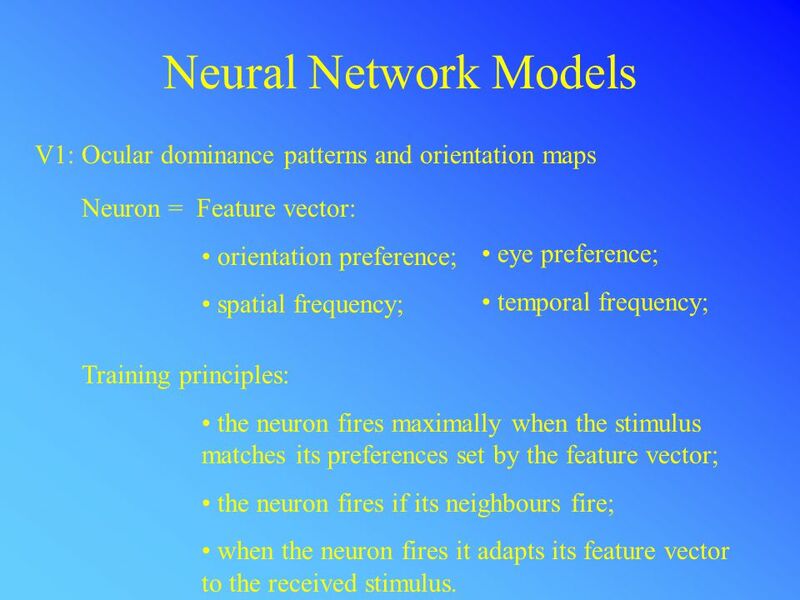 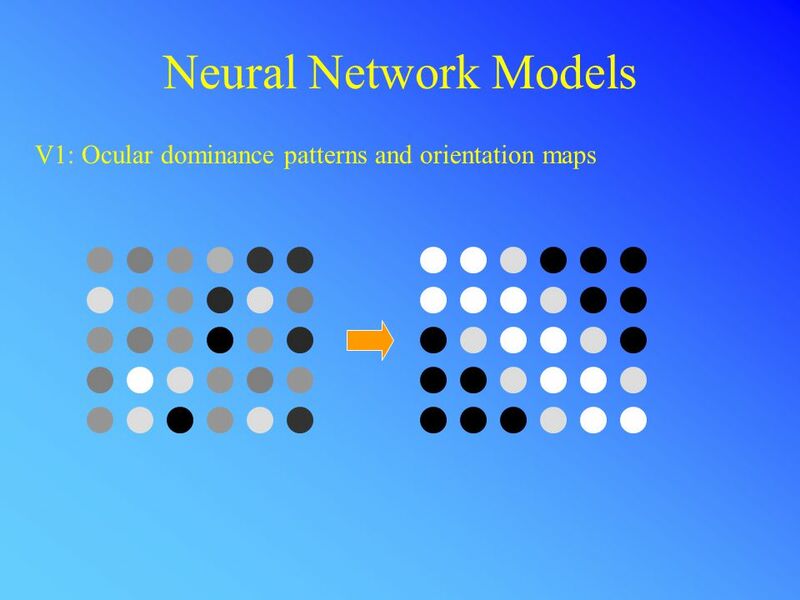 17 Neural Network Models V1: Ocular dominance patterns and orientation maps Neuron = Feature vector: orientation preference; spatial frequency; eye preference; temporal frequency; Training principles: the neuron fires maximally when the stimulus matches its preferences set by the feature vector; the neuron fires if its neighbours fire; when the neuron fires it adapts its feature vector to the received stimulus. 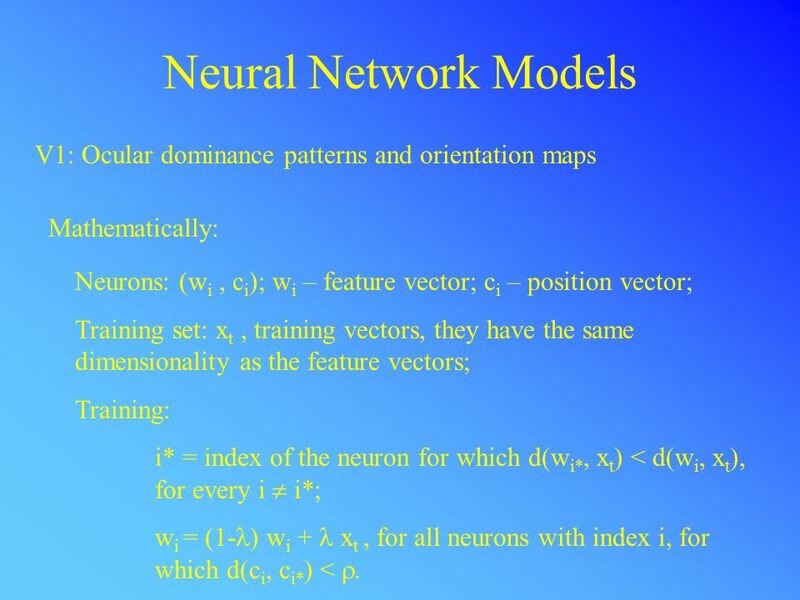 18 Neural Network Models V1: Ocular dominance patterns and orientation maps Mathematically: Neurons: (w i, c i ); w i – feature vector; c i – position vector; Training set: x t, training vectors, they have the same dimensionality as the feature vectors; Training: i* = index of the neuron for which d(w i*, x t ) < d(w i, x t ), for every i  i*; w i = (1- ) w i + x t, for all neurons with index i, for which d(c i, c i* ) < . 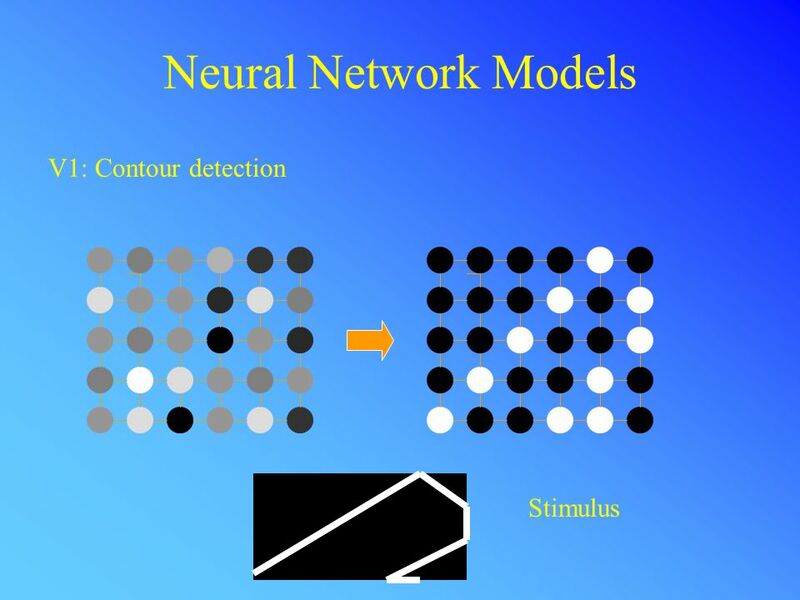 20 Neural Network Models V1: Contour detection Neural interactions: specified by interconnection weights. 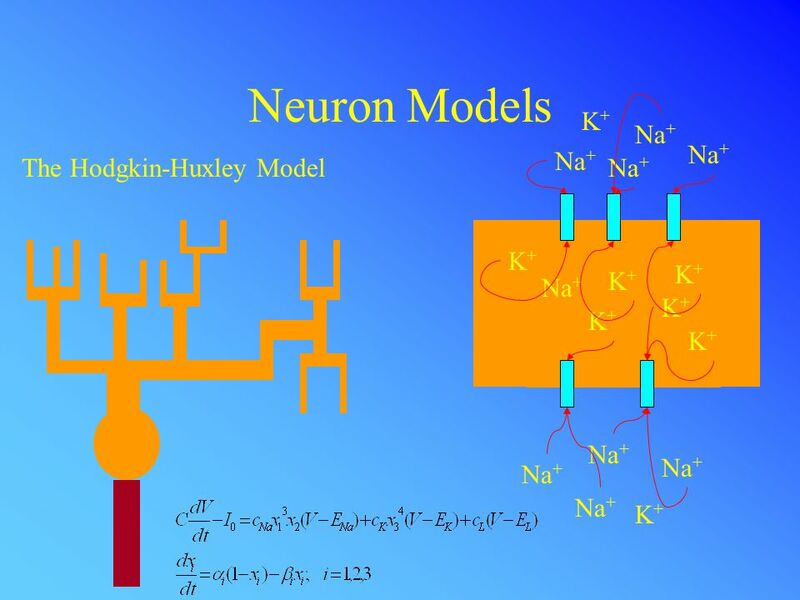 Mechanism: constraint satisfaction by mutual modification of the firing rates. 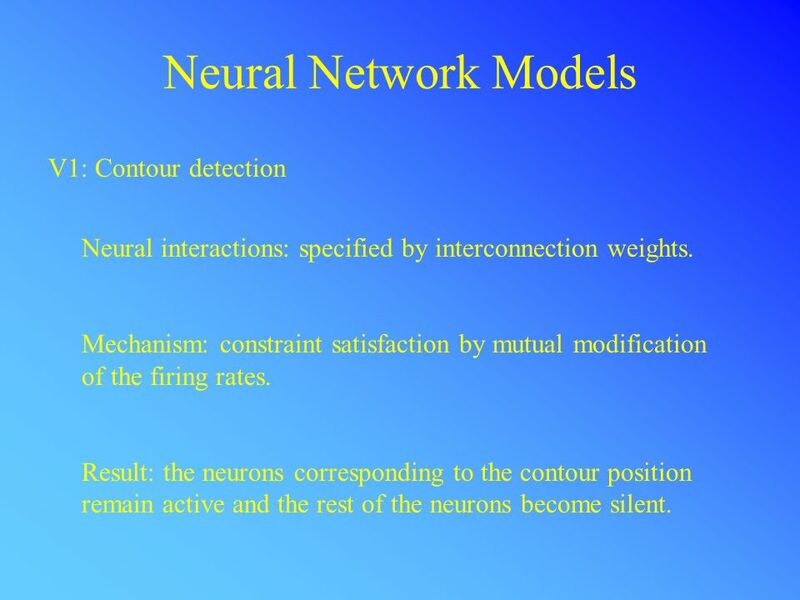 Result: the neurons corresponding to the contour position remain active and the rest of the neurons become silent. 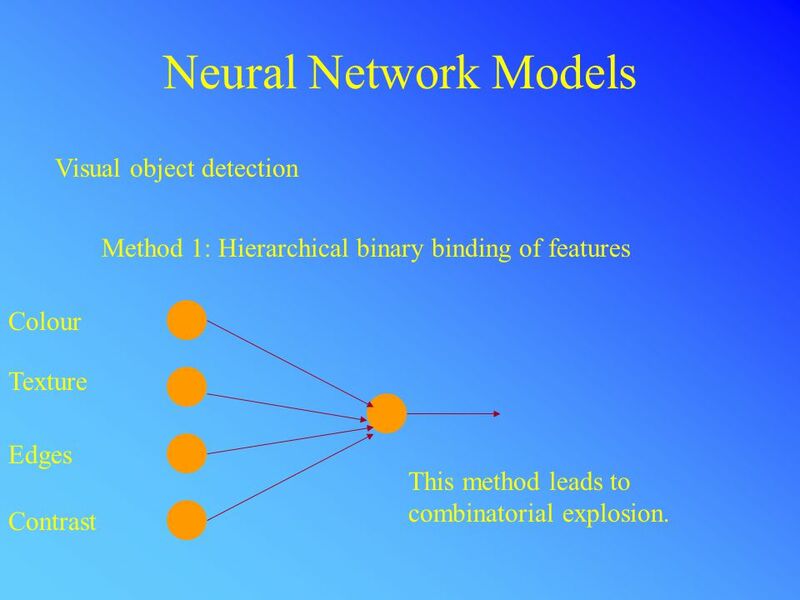 23 Neural Network Models Visual object detection Method 1: Hierarchical binary binding of features Colour Texture Edges Contrast This method leads to combinatorial explosion. 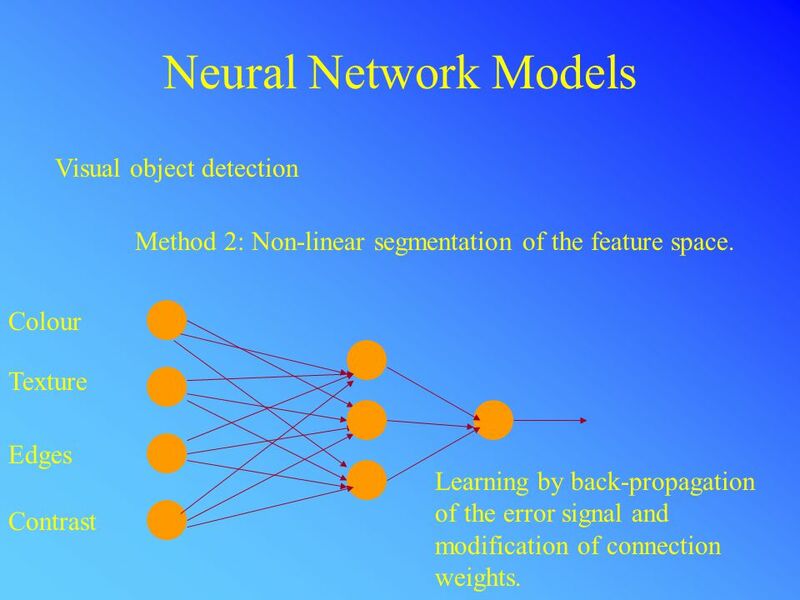 24 Neural Network Models Visual object detection Method 2: Non-linear segmentation of the feature space. 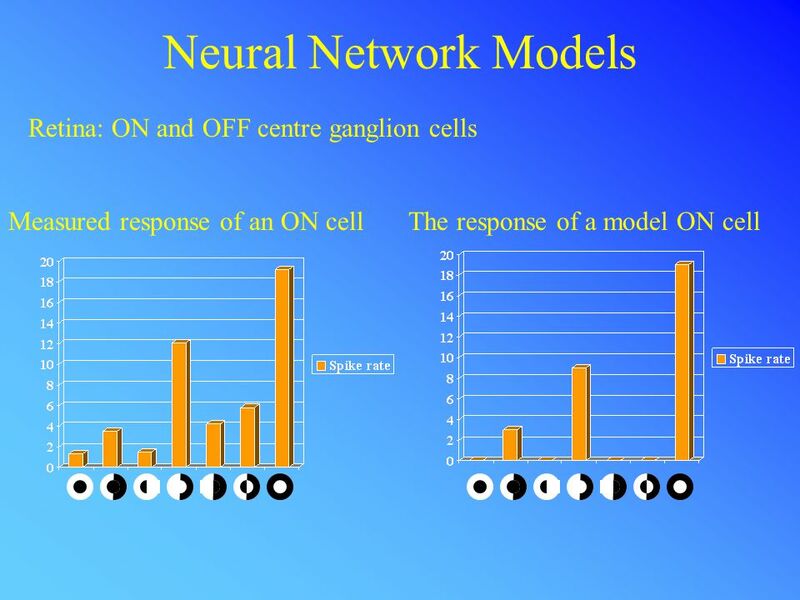 Colour Texture Edges Contrast Learning by back-propagation of the error signal and modification of connection weights. 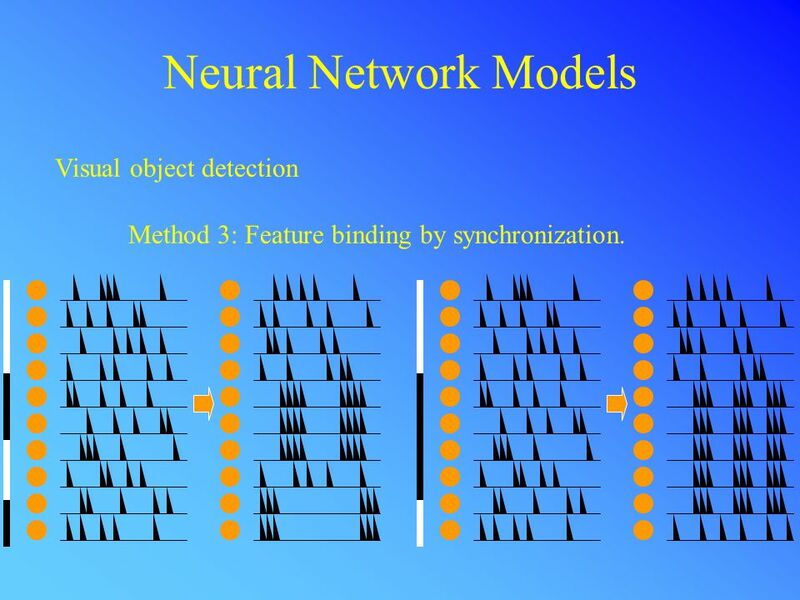 25 Neural Network Models Visual object detection Method 3: Feature binding by synchronization. 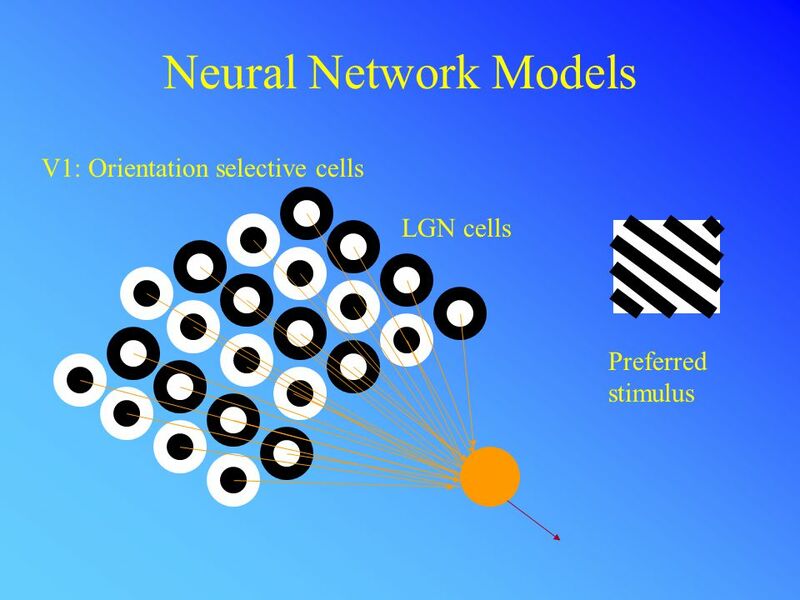 26 Critical Evaluation Neural network models typically explain certain selected behavioural features of the modelled neural system, and they ignore most of the other aspects of neural activity. 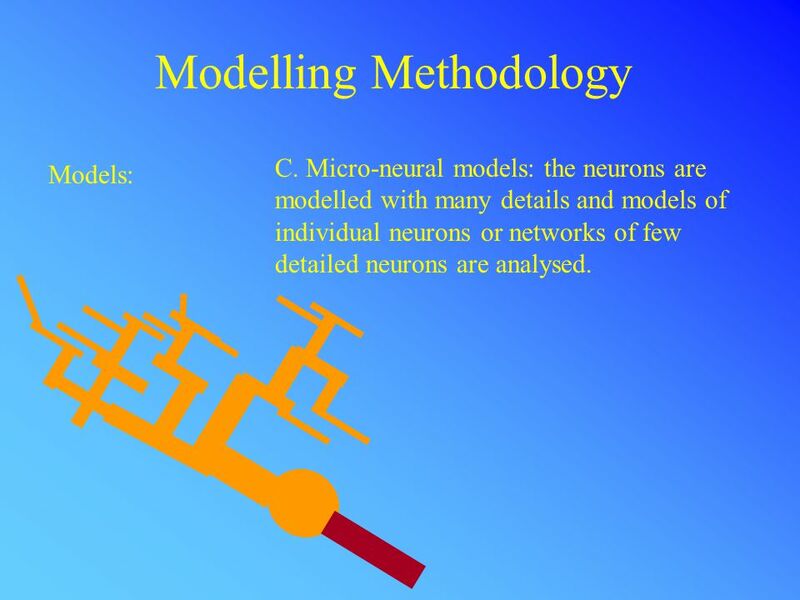 These models can be used to test theoretical assumptions about the functional organization of the neurons and of the nervous system. 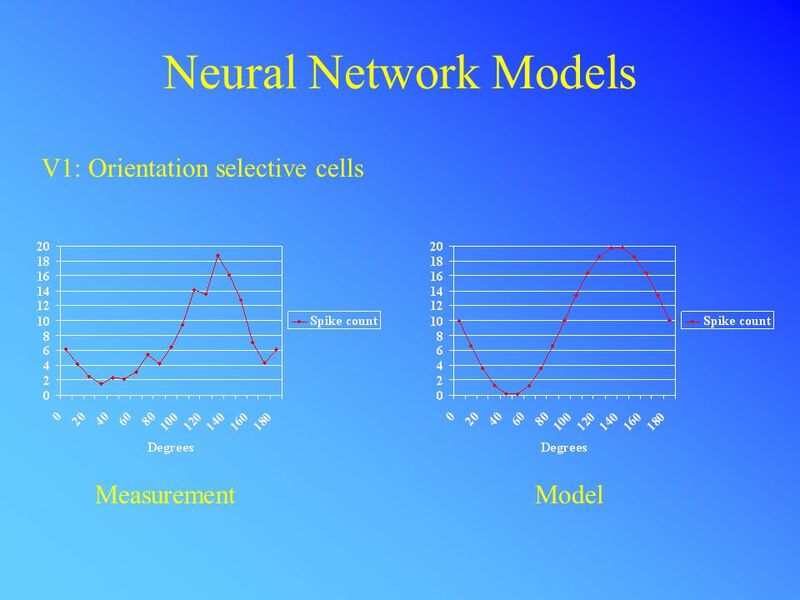 They provide predictions with which we can determine the extent of the validity of the model assumptions. 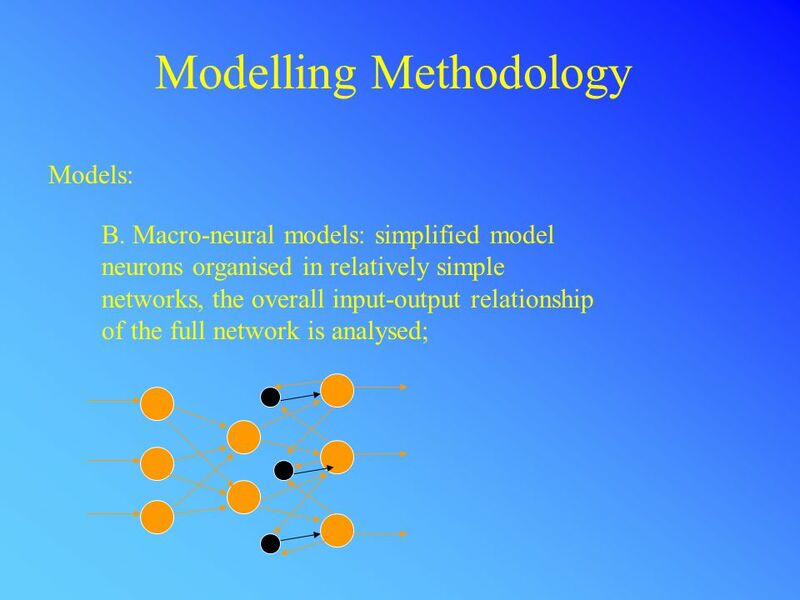 One common error related to such models is to invert the causal relationship between the assumptions and consequences: i.e., the fact that a model produces the same behavior as the modelled, does not necessarily mean that the modelled has exactly the same structure as the model. 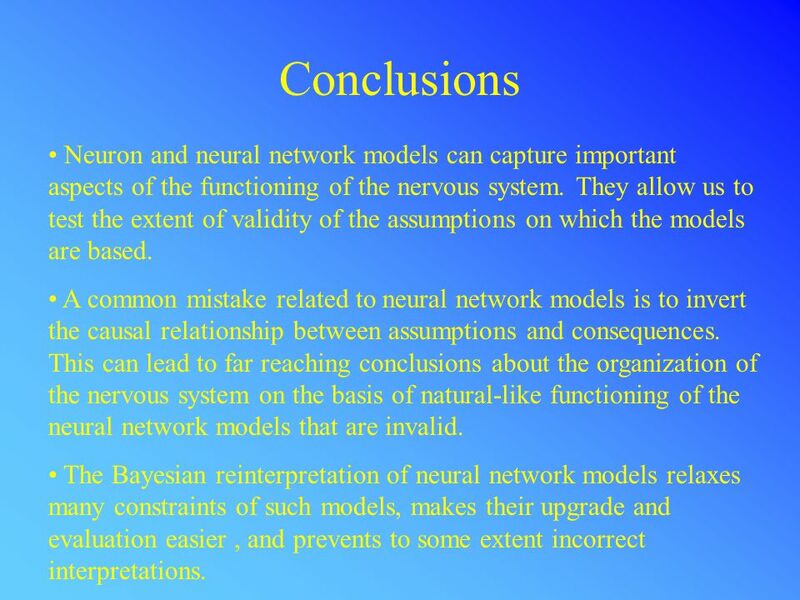 30 Conclusions Neuron and neural network models can capture important aspects of the functioning of the nervous system. 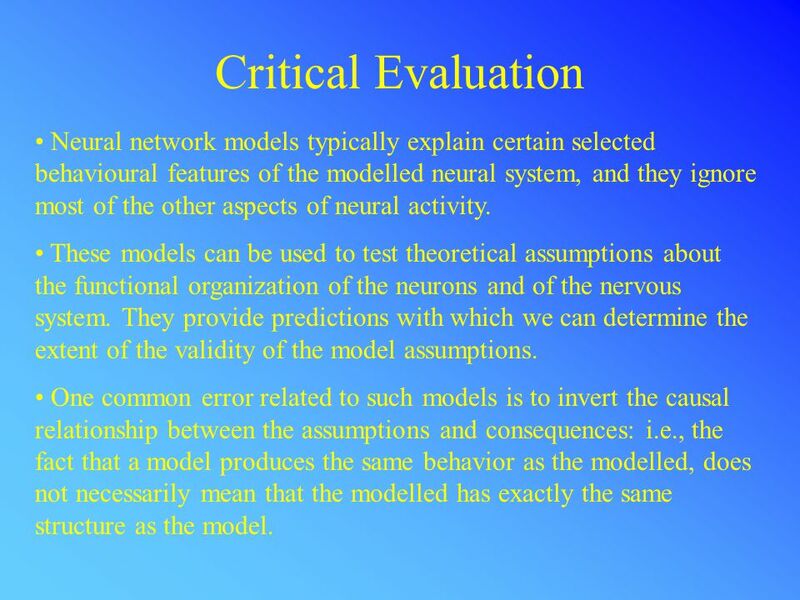 They allow us to test the extent of validity of the assumptions on which the models are based. 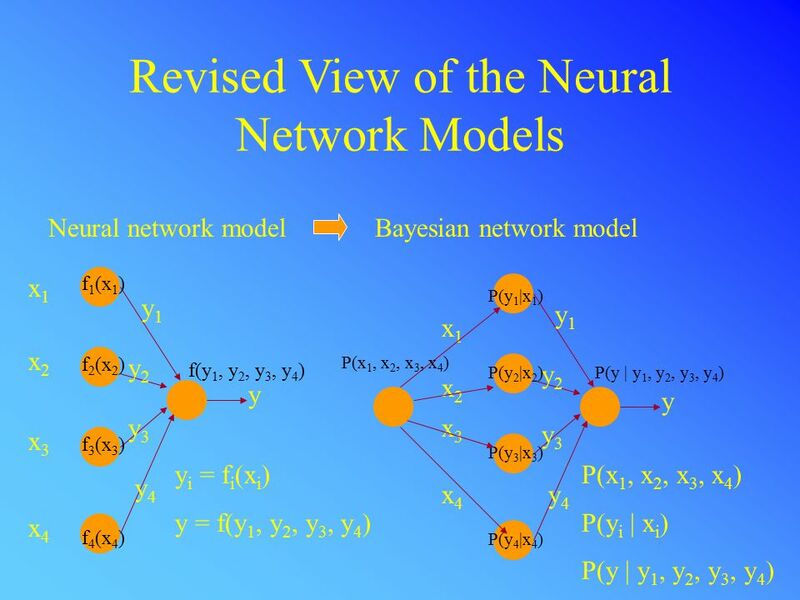 A common mistake related to neural network models is to invert the causal relationship between assumptions and consequences. 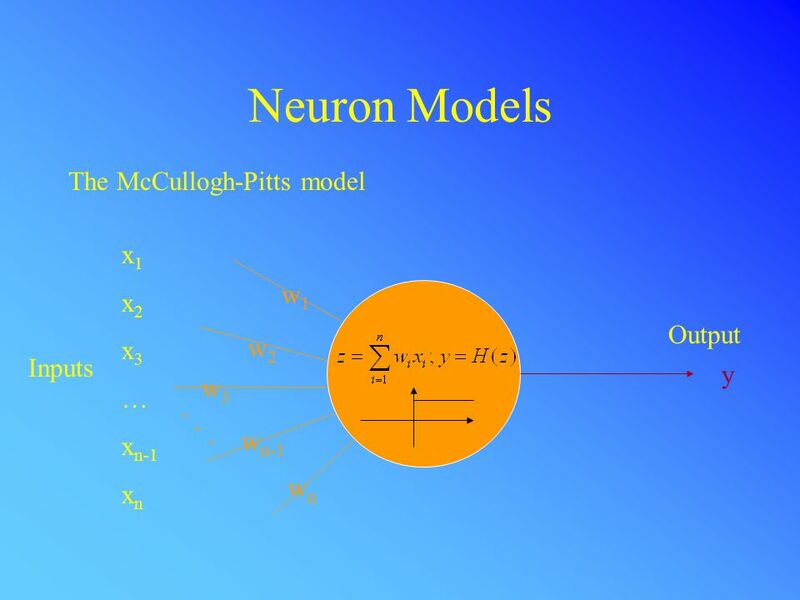 This can lead to far reaching conclusions about the organization of the nervous system on the basis of natural-like functioning of the neural network models that are invalid. 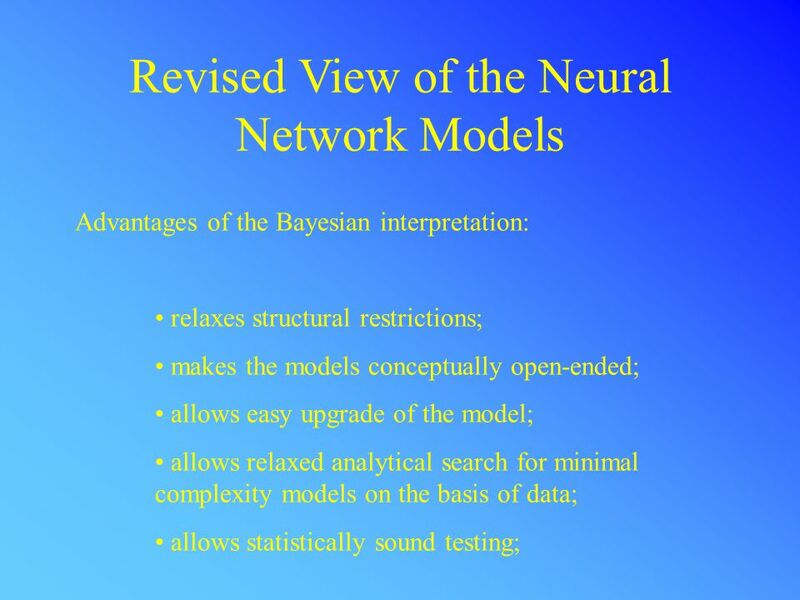 The Bayesian reinterpretation of neural network models relaxes many constraints of such models, makes their upgrade and evaluation easier, and prevents to some extent incorrect interpretations. 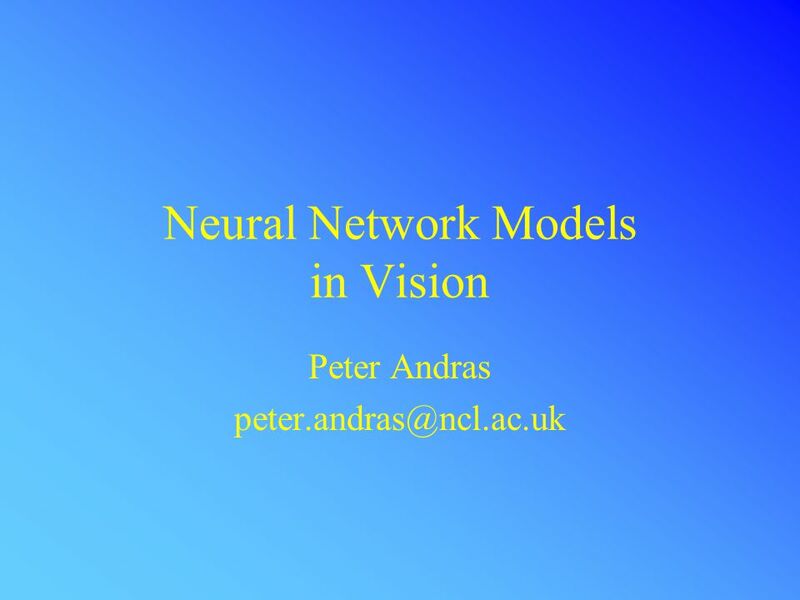 Download ppt "Neural Network Models in Vision Peter Andras"
Midterm 1 Oct. 21 in class. 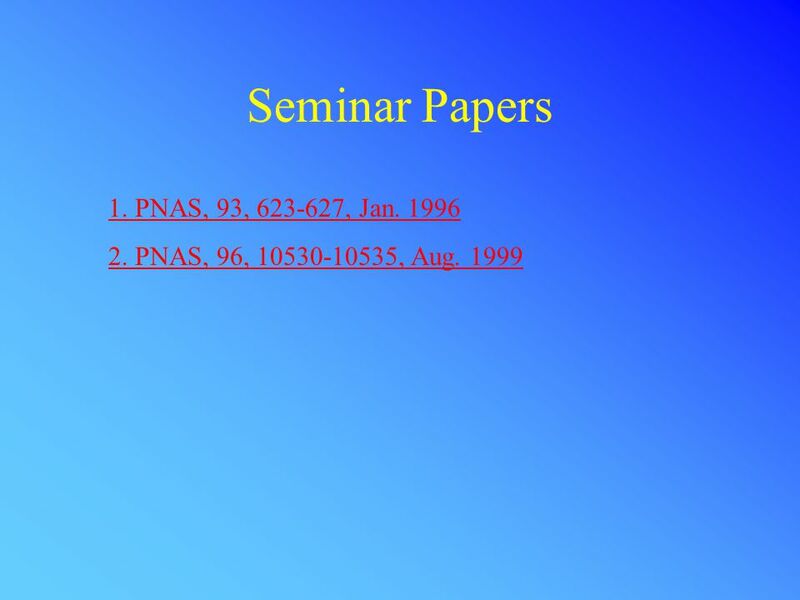 Read this article by Wednesday next week! 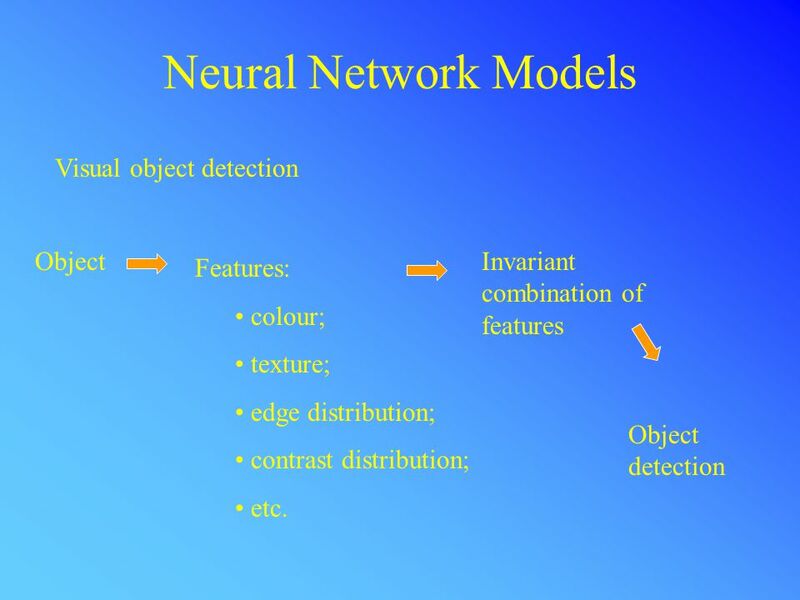 The Visual System: Feature Detection Model Lesson 17. 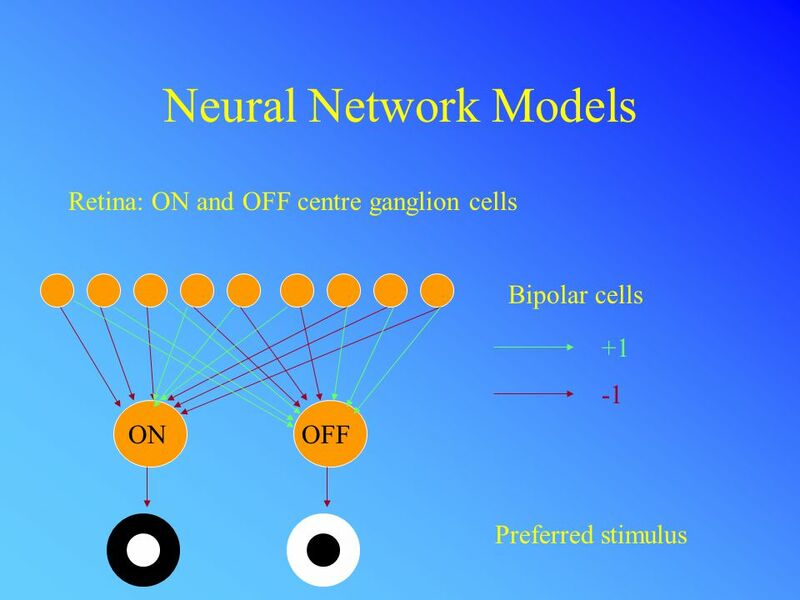 Gabor Filter: A model of visual processing in primary visual cortex (V1) Presented by: CHEN Wei (Rosary) Supervisor: Dr. Richard So. 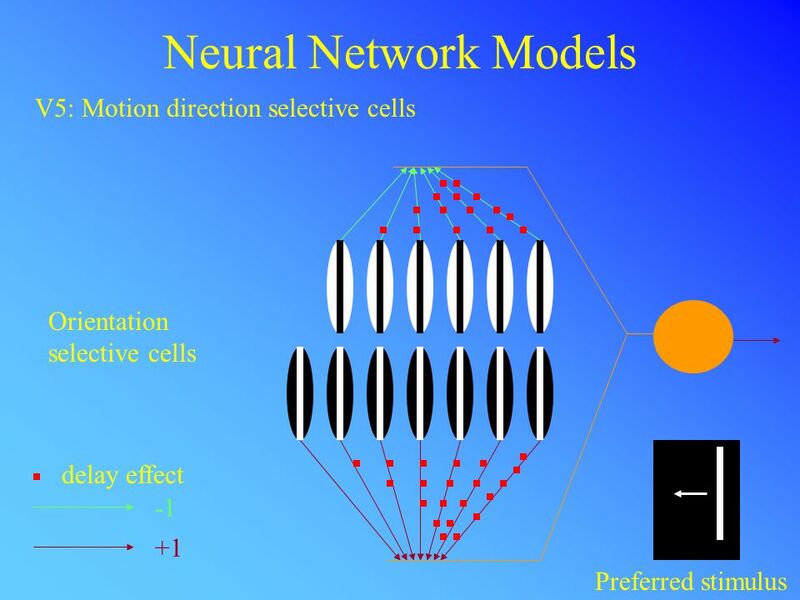 Chapter 3: Neural Processing and Perception. 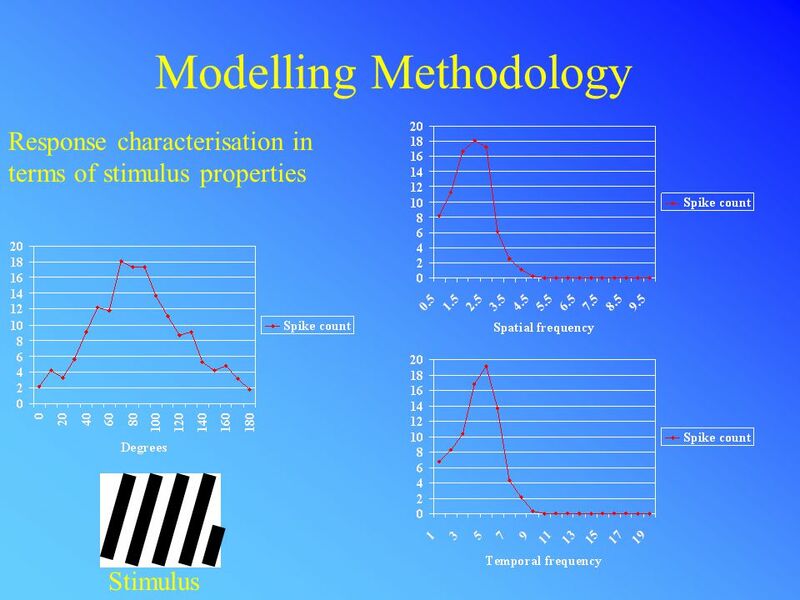 Lateral Inhibition and Perception Experiments with eye of Limulus –Ommatidia allow recordings from a single. 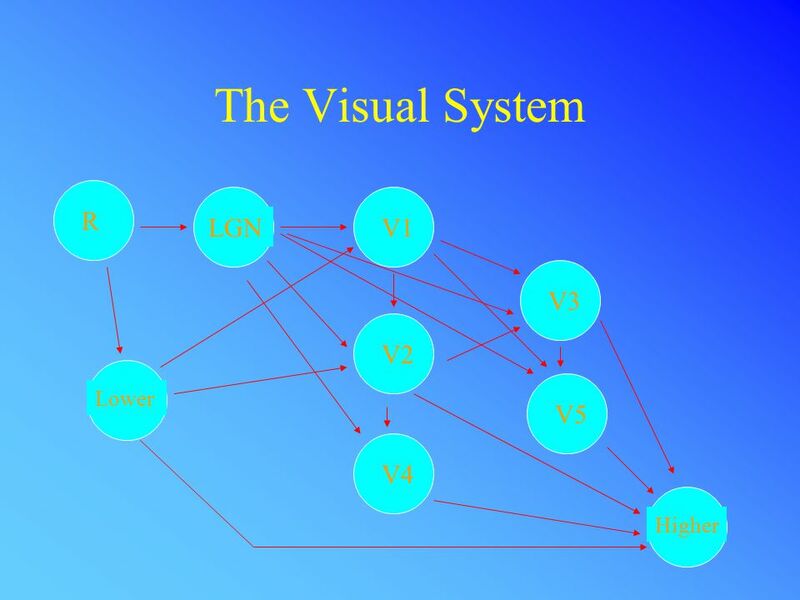 What is vision Aristotle - vision is knowing what is where by looking. 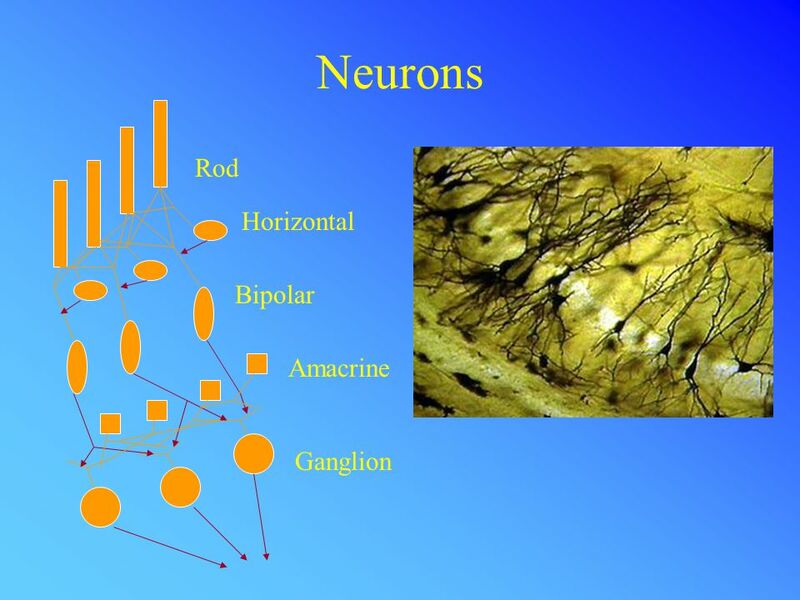 2002/02/05PSYC , Term 2, Copyright Jason Harrison, Visual pathways from here to there to everywhere. 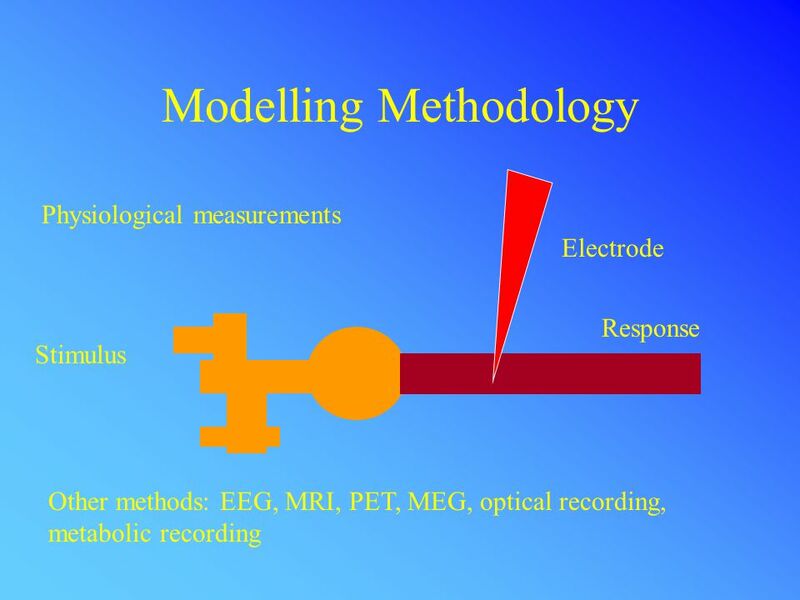 Test on Friday!. 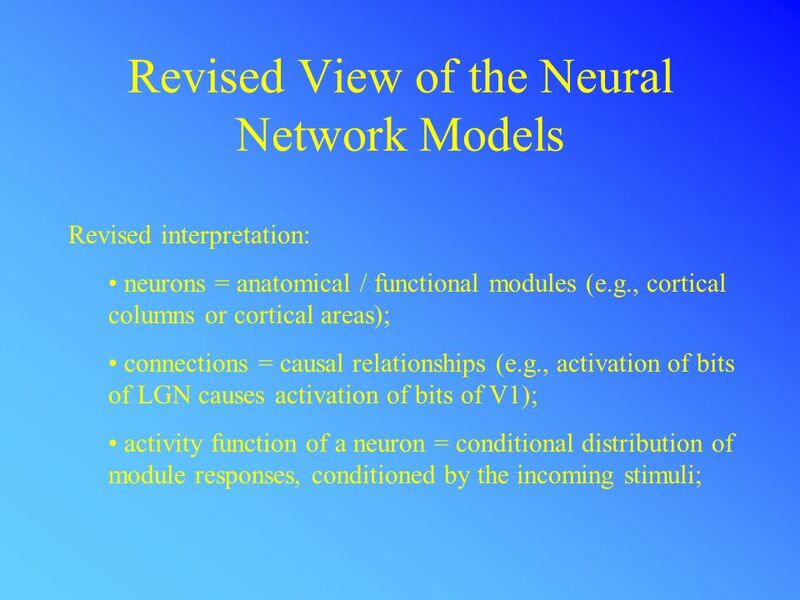 Lesions of Retinostriate Pathway Lesions (usually due to stroke) cause a region of blindness called a scotoma Identified using perimetry.